Say hello to my fun spin on the classic hot crab dip! 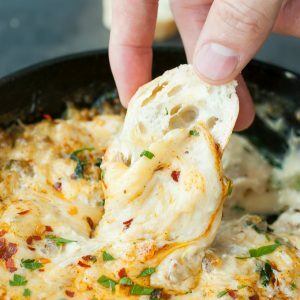 This skillet-baked seafood dip is easy, cheesy, and loaded with crab, shrimp and veggies. It'll be the first dish licked clean at your next party or potluck! Prep shrimp and crab as needed by defrosting, cleaning, peeling and deveining your shrimp and shredding your crab. If you need a shrimp prep guide, I have some photos and mini tutorial [here] You can also buy yours already cleaned and shelled for ease of use! Whatever you do, skip the pre-cooked stuff; the texture always seems to be off. Once prepped, chop the raw shrimp and set aside. Next chop your veggies finely, so they'll mix seamlessly into the dip. Heat a cast iron skillet on your stove-top to medium-high heat with a tablespoon or two of butter and saute the onion, bell pepper, celery and jalapeno until tender. Next add in the spinach, salted mashed garlic, and Old bay. Stir to combine and wilt the spinach. Next add the crab and shrimp and cook for about a minute, until shrimp just begin to turn opaque. Bake for about 15 minutes until bubbly and golden. Remove skillet from the oven, give it a moment to de-molten-lavafy itself, and dive on in with your favorite crusty baguette. Now would be a good time to garnish with some parsley and red pepper flakes before your eat the entire skillet! * I used to always make my crab dips and dishes with canned crab meat. Recently I took the leap and headed to my seafood counter and found that my local store has their own brand of jumbo lump crab and bonus! - it goes on sale quite frequently. Using this fresher option has made a huge difference! The crab is juicy, tender, and full of flavor! Did I mention this entire dish is made in one pan? Let's do this!